Now you can enjoy twice as much vent area as your original vent cover! Exclusive side louvers give you the most cross ventilation of any vent cover on the market! Solid one-piece, sleek aerodynamic design. Includes hinged hardware for easy opening and cleaning - no tools required. 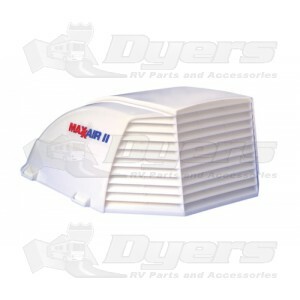 Mounts to the same holes as the standard MaxxAir vent cover. Fits most 14" x 14" standard roof vents. Twice as much vent area as our original vent cover! Hinged hardware included for easy opening and cleaning – No Tools Required. Lets in Fresh Air Anytime... Rain or Shine! Stale Musty Air, Smoke, and Cooking Odors Escape While Rain Stays Out. Made of High Density Polyethylene with maximum UV Protection.